Our premium nursery pots were designed with the serious grower in mind. Whether you plan on using these as indoor flower pots or you’re a seasoned indoor gardener, you won’t be disappointed with the quality and simplicity of these nursery pots. 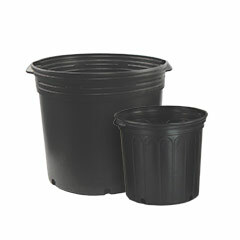 These durable plastic plant nursery pots are made with a tough, molded construction that allows for many years of reuse. The round rim design makes handling the pots easy and convenient. These nursery pots are identical to what you commonly find at the local greenhouse, …offered for less at HTG Supply. We carry a complete selection of sizes, ranging from 1/2 gallon to 10 gallon. 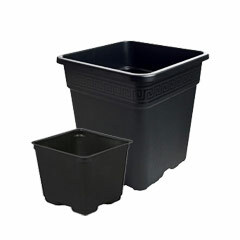 In addition to our round nursery pots, we carry other models like the popular Kord square-shaped plastic nursery pots. We offer these nursery pots in minimum quantities of ten to give you the best deal possible, with even bigger discounts on larger quantities. Find everything you need for your plants including larger planting options such as grow bags, grow pots and more! We offer our premium nursery pots in the following grower-friendly sizes: 1/2 gallon, 1 gallon, 2 gallon, 3 gallon, 5 gallon, 7 gallon and 10 gallon. We also offer other pots and containers in a variety of sizes, and we continue to add more products to our store all the time. If there is a specific brand or type of nursery pot you are looking for, reach out to us and we will do our best to help. Our website is already setup to give you a discount on multiples of 10 and 50 pots. If you need significantly more than 50, contact us and we may be able to work out an even better price on our nursery pots in bulk. Otherwise, you can already get a great deal on these nursery pots by buying in increments of 50. 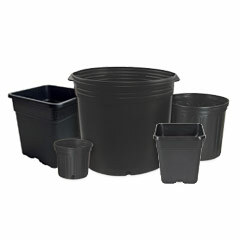 If you are interested in wholesale nursery pots, you may be interested in some of our other commercial grower services.